By popular demand, learn how to make a Macrame Plant Hanger! 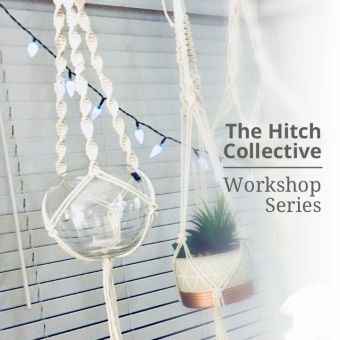 Join Amanda from The Hitch Collective for two hours as she shares her passion for and knowledge of macrame, fibre art. You will learn basic knots of macrame, creating your own hanger to hang proudly in your home. This joyful and fun filled experience is fostered by a supportive and creative enviorment. Be prepared to laugh and experience your full potential in the art of macrame. The workshop is suitable for beginners, new and old to macrame. All materials will be supplied to create your hanger, so come with an open mind for fun and bring a friend!